I'm gathering together some bits as the data is apparantly sent over 433.92MHz AM radio by OOK (On-Off-Keying) and there is some info on the 'tinterweb about the protocols used. I may just get another weather station with serial out on the receiving consol and do it that way. I also have a Raspberry Pi on order (for ages now), maybe a low power web server and automatic weather station??!! Too many projects and not enough time...! The RF22 can certainly do OOK, but it will not be trivial to do the software to read whatever protocol they use... Maybe it's possible to intercept the data before it gets to the transmitter on the weather station, and use your own tx rx? I also want a Raspberry! available were the RFM22B-868-D, will those work? Does it need to be the 433 model or it's possible to change the frequency. The 868MHz version should work just fine. I can even change my 434 module to 960MHz, but obviously it won't work very well. 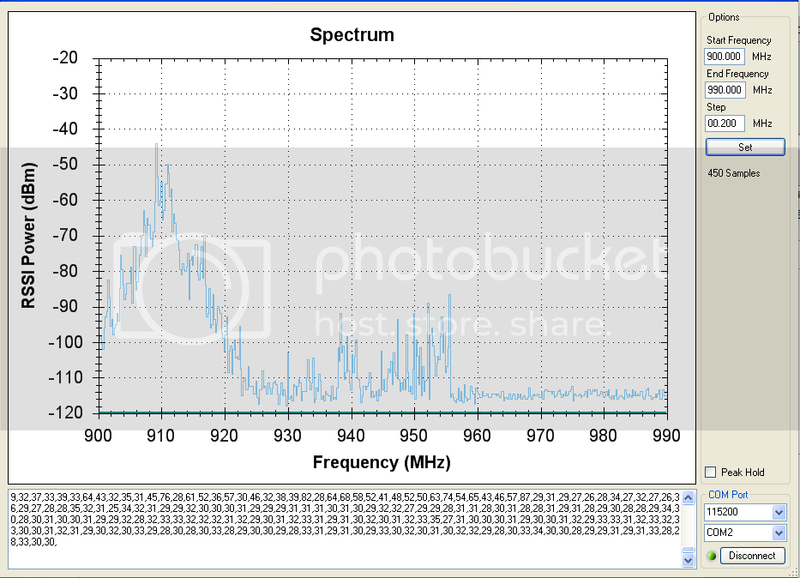 You might need to make sure that 868MHz is a legal frequency in Ireland! Okay one thing iv noticed between the different in graph that you postted and the one i posted yours seems to be a lot cleaner and not as jagged spiked like mine . but that said mine is set to max output. 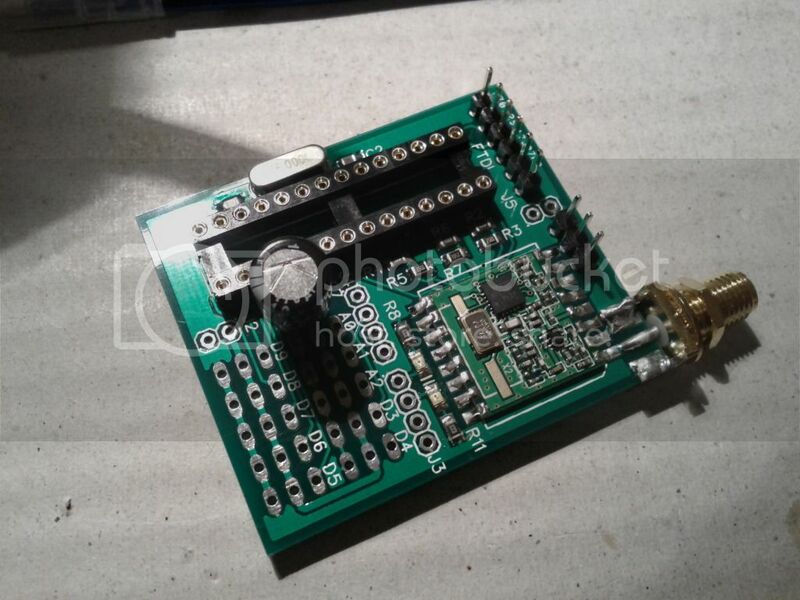 once i get my board from you i would like to use it to test home made 433 radios . what would be the best set of settings for use with RF probes and not antennas? i would image i would set the Tx/Rx power right down to minimum ? Did you leave it alone to gather data for long enough? The peak value should smooth out over time. I think the best way to test radio output would be to connect the tx to rx directly with an attenuator, so you don't have to worry about antenna weirdness. Then again, I am definitely not qualified to answer any RF related questions! Here is the code for a standard 10 channel PPM RC tx+rx for my boards. You must use my modified version of the RF22 library! On the TX you need to connect 5V PPM to header D3. You can put a switch or jumper on the header next to the RF22 (GPIO2) to switch between low power (1dBm, 1.3mW) and high power (20dBm, 100mW, red LED on). You can easily change the frequency in the code (remember to change rx as well!). On the RX the LEDs indicate RSSI values: Green > -70dBm, Green+Red > -85dBm, Red > -100dBm, else/no signal = no LED. Be careful not to connect servos the wrong way around. I didn't use current limiting resistors on the arduino pins to save having to solder 10 more SMD resistors, so it is possible to damage the output pins if they somehow get stuck on and end up powering your servo! For the ones that ordered the RFM22 from RF-store how long did it took to arrive? I have all the parts to build the boards (except some solder paste) but I'm still waiting for the RFM22. I made the order on the 4th of this month. Mine took less than 1 week from Germany to England - not bad for just a few Euro's postage. You should be able to log in to your account and check your order status. They replying saying that it got out of stock in the mean time... and haven't sent it yet. Maybe still during this week they'll received more. That is pretty cheap, but I don't see a register for the RSSI value anywhere. It's register 05 for the RSSI. We'll I'm going to start assembling the boards as yesterday I got the solder paste and I expect the RFM's to arrive during next week. That's a long time to wait! I have been flying my plane with the RFM22, it's working great so far. Register 05 is write-only, it's "RSSI Threshold for CD detect". You can't read the RSSI value from it. And if I hadn't contacted them I wouldn't even knew what was going on. That's right, I totally ignored the 'W'. But if it allows to seat RSSI report or not, it must have a way to read it. Seems more are looking for it. Almost ready to start testing. I forgot about the switch, so instead I'll use a jumper on this one. This is really good stuff, super easy t build. of single pins and if the distance was equal it would be easy to solder them. This way I have to split them all in single 3 pins. Quick test made with my 900Mhz FPV vTX on chan 0. Looks great! Glad you got it working! Good point on the pin spacing. I found that it was quite annoying trying to solder 10 3x1 pins as well. You only need the switch if you plan to use my RC transmitter code, in which the switch changes output power. If you do use a switch like the one I used, make sure the metal parts of don't short out the pins under/around it like I did! I'm back home and ready to finish the other boards. I do plan to make this a TX/RX set, using it as a Frequency scanner was just an extra and a easy way to test. I'll see if I can finish a second board during the weekend to give it a try. It could be quite nice to have the boards act as a wireless serial bridge. Telemetry boards with similar performance are usually much more expensive. Please share your code when you get it working! Since I have sold and/or used all of my boards, I decided to make a batch of new ones. - Will use a slightly better LDO for 3.3V: MCP1825S. With only 210 mV drop out, so may benefit people like myself that using lots of servos powered from 5V.